The Oly Mountain Boys | Pacific Northwest Bluegrass | Blog : White Horse is here! We spent our Labor Day weekend signing and shipping over 150 box sets to our Kickstarter backers. And so far they like what they hear! We've heard lots of compliments about the music and the accompanying written material. Now we're getting ready to release it all to the rest of the world. 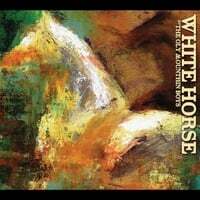 White Horse will be available to buy on our website through CDBaby on September 25th. Between now and then, we'll be working with Sue DuMond to get White Horse out folk and roots DJs, reviewers, and YOUR favorite radio station - let your favorite bluegrass DJ know they should request a copy from us! SEPTEMBER 24th-26th - To celebrate the official release, we take things on the road. We'll be in Portland (9/24, 8pm, Alberta Street Pub with the Hollerbodies - $8), Hood River (9/25, 8pm, Double Mountain Brewing), and White Salmon (9/26, 9:30pm, Everybody's Brewing). THURSDAY OCTOBER 2nd, 7pm - Tell bluegrass-lovers far and wide - they can tune in on the web for a special ConcertWindow show featuring songs from White Horse! SATURDAY OCTOBER 4th, 9pm - We cap it off Oly-Artswalk style with Kindred and The Hollerbodies at Rhythm and Rye ($5)! We hope you'll be part of the kickoff - help us spread the word about this album!